If you’ve decided to update your outdoor space with a retractable awning, you’ve probably researched them well, but here are five things that you didn’t know about retractable awnings. When people consider purchasing retractable awnings, they usually do it to supply shade to their outdoor spaces, like porches, patios, and decks. What they fail to realize is that awnings are meant for more than protection from the sun’s harsh rays. They are an all-weather protector. This means that you can sit out in the rain or out in the snow if you chose while ensuring that you stay comfortable in almost any weather. For instance, there is the cassette awning. 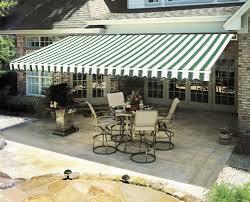 If you take a look at cassette awning pictures, you’ll see their owners enjoying them in all kinds of weather. If you’re worried that your home simply isn’t built for a retractable awning, you’re wrong. They are designed to be mounted almost anywhere outside your home, so you can get the outdoor coverage that you need. For example, if you look at cassette awning pictures or pictures of other types of awnings, you will see that they can even be attached on specially designed roof mounts. When you think of sun protection for your outdoor living space, your first though is probably the shade that an awning or exterior zipper shade provides. In fact, it does much more than that. An awning actually blocks up to 98-percent of harmful UV rays, which can actually lower your risk of developing skin cancer from sitting out in the sun. This means that you can sit outside and enjoy the weather without worrying about your health. If you plan to buy a retractable awning, you probably assume that you’ll simply have to pick the best color that will match the look and color of your home from what’s available. In fact, this isn’t true. The awnings are constructed of acrylic fabrics and dyed in a special solution which provides you with 200 color options to choose from. This means that you can easily pick the best color that will either match or compliment your home. If you need a bit more room for summer guests, you can actually use the exterior zipper shade to enclose your deck or porch. This particular shade systems retractable cover allows you to create an entire room that keeps bugs and heat out while allowing cool air in. Eclipse provides custom shading products through a qualified network of local, independent dealers. They can provide you information on pricing, ordering and installation. Information provided by this search is for informational purposes only. Dealers are independently owned and operated; consequently, Eclipse assumes no responsibility for their actions. Reduce Energy Cost, Add Value! Enter your zip code above to find your local Eclipse dealer. (5) 6'7", 8'2", 10'6", 11'6", 13'0"
(5) 5'0", 7'4", 9'0", 10'6", 11'6"